Today started much like any other day – I wake before the alarm goes off at 6am but still usually wait until I actually hear it before getting out of bed! I like to check my emails, Instagram and Facebook accounts on my phone before getting out of bed. (I know, not good. But hey, who knows when I am going to get another chance, and I like to know what has been going on in the world while I have been sleeping). I go downstairs and make a cup of tea, prepare breakfast for Mr 3 and make sure his bag is all packed ready for nursery. Some days I might get a chance to catch up with some emails, write a blog post or go to the gym, but today I spend some time writing a note to a friend and wrapping her new baby gift that I need to get in the mail today. Whatever I do, I always check my diary. I love this little bit of “me time” before the days gets going. At 7am I wake Mr 3 with a cuddle and tickles, we play for a few minutes and then make our way downstairs together. Once Mr 3 is settled eating his breakfast, my husband takes over and I get showered and ready for work. By 7.45am Mr 3 is washed, dressed and ready to go, so we jump in the car, say goodbye to Daddy and start our day. Nursery is only five minutes’ drive away and we talk about the shapes in the clouds on the way. We have some great conversations on the way to nursery, some of which I note down when I get back in the car for my Project Life album. Once Mr 3 is happily in his class with his friends, I jump back in my car and head off to work. On a good day it takes 20 minutes, but it can be up to an hour on a bad day. This is Dubai after all, and the traffic can be very unpredictable! On the way to work I review the goals I have set the night before, and start planning my day. All whilst singing along to whatever song the local radio station is playing! If I’m lucky I get into work at 8.45am, catch up with my team, get out the to-do list and crack on. My favourite kind of day is one with a couple of meetings, plenty of time to work, maybe a quick lunch with a friend or at least the chance to take 30 minutes to read or write while I am eating my lunch. I try to bring my lunch with me to work, but today was a big fail and I ordered a healthy salad which I ate whilst writing a letter to my grandmother. I love writing letters – email is great but there is nothing like a proper letter. I pop to the post office and mail the new baby gift too. That’s another thing crossed off my to-do list, which always makes me happy. At 4.30pm I leave the office and head back to nursery to pick up Mr 3. I call a friend on the way for a chat – I try to speak to my parents or a friend each day when I drive home, to make good use of the time. Mr 3 loves nursery and it is fun to watch him play while I chat with his teacher and the other mums for a few minutes. The drive home brings more questions from the little guy. Today’s big question was “How many T-Rexs would have to stand on top of each other to reach the top of the Burj Khalifa?” The Burj Khalifa is the tallest building in the world, and we are lucky enough to live in the same city and see it from our house. It’s often a topic of conversation! We get home at about 5.30pm, work out the Burj Khalifa question (the answer is 138, in case you were wondering!) and play snakes and ladders while Daddy cooks dinner. I also unpack our bags, putting the lunchboxes in the dishwasher and taking out any artwork. I like to put the date on the back before sticking it up in our “gallery” (the kitchen door). Eventually it gets photographed and scrapbooked, but that’s another story! We share the cooking duties, as we share pretty much all the household tasks, which makes life much easier for both of us. Opening the front door to the smell of a good chicken curry is also a bonus! We eat dinner at about 6pm all together at the table. This is one of my favourite times of day, when we sit down together and tell each other about our day. This is so important as the three of us are apart all day, experiencing different challenges and learning new things, which we like to share when we get back together again. We don’t cook separate meals for Mr 3, so this is also a good time to introduce him to new foods and talk about healthy eating and where food comes from. We love eating in this house! Apart from the Burj Khalifa question, tonight we also talk about what we’ll do at the weekend, the Oscars and the constellation Orion which Mr 3 discovered with Daddy last weekend. Once dinner is finished we all help to clear the table and load the dishes in the dishwasher. 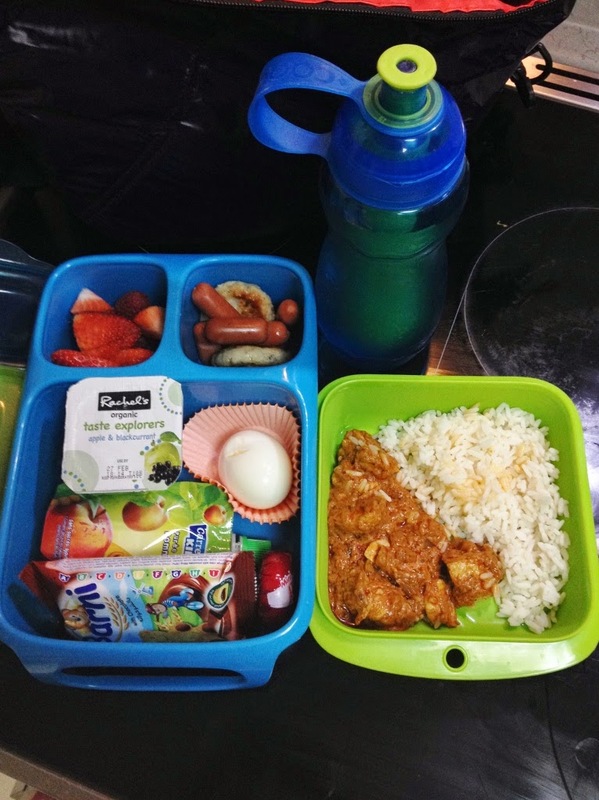 There is leftover chicken curry and rice, which goes straight into Mr 3’s lunchbox for tomorrow. I pack his snacks too and put it all in the fridge, ready for tomorrow morning. Packing the lunches the night before saves so much time the next morning, and I like to clean the counters and kitchen sink before finishing up. After some more snakes and ladders, I bath Mr 3, read a bedtime story and then lie with him for 10 minutes while he drops off to sleep. He’s such a cutie but I am ready for him to sleep tonight, as I have more work to do from home and a blog post to finish. My husband is also working on his computer so we chat away while we are working. It’s been a busy day and I would much rather watch TV or do some scrapbooking, but I have some things to prepare for tomorrow in the office and I know that my day will be much smoother tomorrow if I get ready tonight. I always try to clear my emails and write tomorrow’s to-do list each evening, so that I can hit the ground running in the morning. I turn off the laptop and head to bed at around 10.30pm, pretty much my usual time - I need my beauty sleep! I fall asleep knowing that I’ve had a productive day, spent time with my family and spoken to a few friends. I’m ready for tomorrow, when we’ll start all over again! Good night! 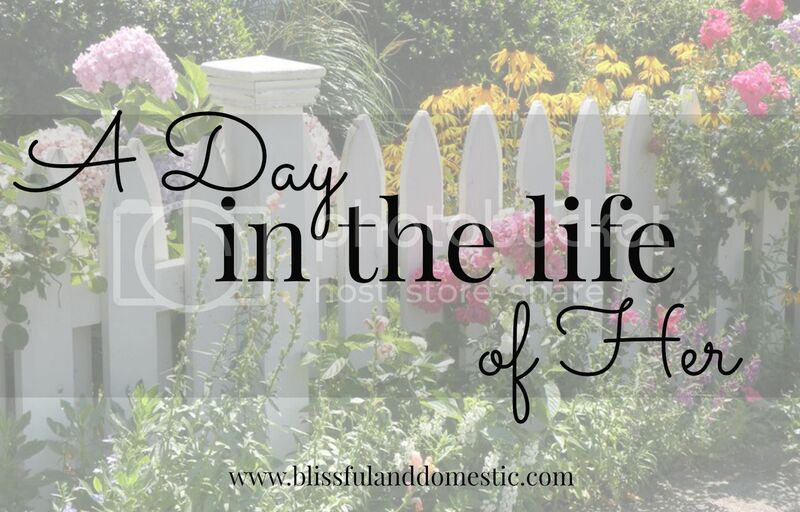 If you would like to be a part of the "A Day in The Life of Her" series, shoot me an email. I'd love to have you!